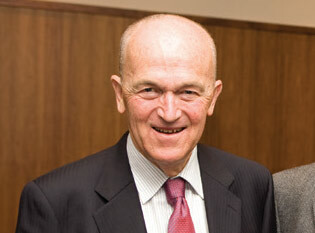 AMSI and ICE-EM owe much to Garth and the contribution he made over the five years 2003 to 2007. Garth, with Tony Guttmann and Jan Thomas, drove the vision and commitment to establish AMSI. As foundation director Garth put in place the basic structure upon which AMSI has been built. His most significant achievement was obtaining and leading the ICE-EM grant in 2004. This grant funded not only AMSI’s remarkably successful school education program but also many innovations in research and higher education including AMSI’s flagship programs and our Access Grid network. ICE-EM’s impact cannot be underestimated. Garth then moved to the position of Director of ICE-EM to oversee the major initiative to improve mathematics education, especially in schools. Garth recruited first class staff and team of authors to work with him on producing a remarkable series of texts. These texts, now in their second edition and marketed by CUP, have had a seminal influence on school mathematics education in Australia. ICE-EM’s work has established AMSI as an influential policy maker and a provider of school educational materials second to none. Garth’s vision and strength of character continue to be an inspiration to AMSI members and staff. I regret very much that I cannot come to Melbourne for this very special occasion and to accept the medal in person. My contribution to AMSI was as a member of a fabulous team. I especially want to acknowledge the contribution of the ICE-EM team, Michael and Janine in particular. With meticulous attention to detail, ICE-EM produced outstanding materials for schools of which AMSI can be justifiably proud. We had wonderful Chairs of our Advisory committees and an outstanding chair of the Board in Jim Lewis. We were also very fortunate in having Brendan Nelson as the key Minister at an important time and the advice and help of his science adviser Thomas Barlow. I thank all the AMSI staff, members, Board members and others for their dedication and hard work that supported me as AMSI and then ICE-EM Director. They made AMSI the success it has been and will continue to be. I wish AMSI many more years of success in supporting and promoting a vision for the mathematical sciences in Australia.